Suriya is among the most popular actors down South, with a huge fan base across the Telugu and Tamil film industries. Small wonder then, that interest in the actor's upcoming big summer release — the sci-fi film 24 — is extremely high. Marketed as a bilingual (in Tamil and Telugu), 24 is being directed by directed by Vikram Kumar, who had last made the blockbuster Nagarjuna family story Manam in Telugu. 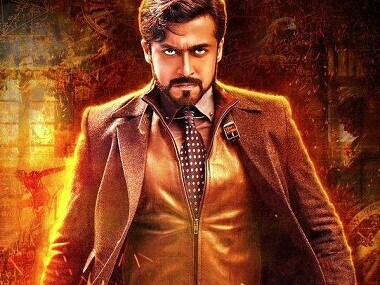 24 has Suriya in a triple role as a scientist and a gangster, while the third role is that of a romantic youngster. The film also has Samantha and Nithya Menen with music by Oscar winner AR Rahman. The teaser of the film (released a month ago) was a runaway hit on YouTube and had record views. On Monday, it was a double delight for Suriya fans when the Tamil and Telugu audio and trailer of the film were released on the same day (10 April): in the morning at Chennai’s Sathyam Cinemas and in the evening at the Shilpa Kala Vedhika in Hyderabad. The trailer is slickly cut and the three characters Suriya plays in the film are something to watch out for. Suriya’s body language and variation in dialogue delivery is well brought out in the trailer, which also has him romancing Samantha. The music by AR Rahman is peppy and sure to catch on. The audio launch in Chennai was unique as not just Suriya, but also his brother (the popular actor Karthi) and father (veteran actor Sivakumar) were all present on the same stage. About how he took up 24, Suriya said : “I chose the film after a nearly 5-hour narration by director Vikram Kumar. The script is amazing and it is different within the commercial format. Rahman initially gave us half an hour to narrate the script, but sat through for hours listening to the script and later sent me a text message — It’s going to be an ambitious project and let’s work together.” Rahman who was also present at the audio launch, smiled as Suriya recounted this anecdote.